This highly treacherous area is legendary for stranding many a ship. It is for this reason that Arrapago Reef became the final bastion for a kingdom that was destroyed by an attack from Aht Urhgan. 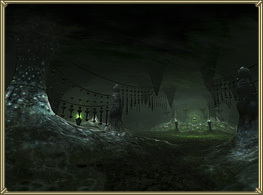 It is said that the kingdom's immense treasures still rest in the coastal caverns. However, the Lamiae are currently using the reef as their stronghold, guarded by the sleepless undead. Infiltrating Arrapago Reef would be no easy task.